We donated my brother to science. Actually, we donated parts of him to science and the other parts to people who, well, needed his parts. I have wondered many times in the last few years whatever became of my brother’s kidneys, his eyes, his heart. I’ve also wondered whether or not the idea of cellular memory is really true. My brother was rambunctious, wickedly funny, a tender soul, a daredevil. Would my brother’s kidney, placed inside a sweet, innocent librarian create a hard living party girl? I can imagine the unobtrusive librarian, her mousy hair pulled back in a tight bun, feeling a sudden and overwhelming desire to run outside in the sunshine, throw on a leather jacket like Pinky Tuscadero, jump on a Harley and do wheelies up and down the sidewalk in front of the library. Would the recipient of Todd’s organs suddenly know how to splint a broken leg, or do a 360 on water skis, or remember the baby scent of his now-fatherless daughters? Would the recipient suddenly have scores to settle, wrongs to right, a quest to find the people who loved Todd and weren’t ready to see him go? 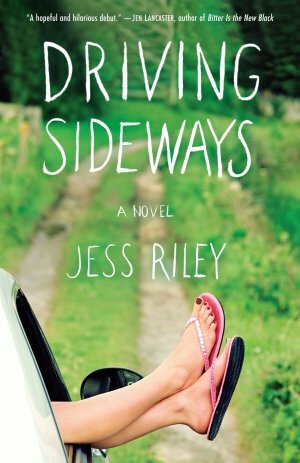 Driving Sideways is a wonderful, funny, charming and heart-wrenching story about Leigh Fielding, a woman who gets a second chance. Her wish is to make it to her thirtieth birthday. Now, thanks to the generosity of the late Larry Resnick and his transplanted kidney, it looks like her wish may come true. Leigh hits the road in her trusty Saturn on the trip of her lifetime, including a stop to thank Larry’s family. Leigh, courtesy of her new kidney, finds herself a changed person. What I found was an original, funny, beautifully written story. And Jess, a wonderful author who made me believe that cellular memory is real. So the next time I see a librarian doing wheelies in front of the library after hours, I’ll have to stop her and ask if she knows my brother. I hope you’ll read Driving Sideways. And Jess, I’d be curious to know what kind of research is out there for cellular memory. Wow. Organ donation has always been something I feel strongly about even though it’s never been an issue that has come up in my family, other than in passing conversation. How amazing, Lisa, that your brother lives on in the lives of others. What an amazing legacy. And I’m so amazed that it makes me overuse the word amazing. For my next birthday, I would like a thesaurus. Lisa, this was just heart-wrenching … I’m so sorry about the loss of your brother. He sounds like a wonderful man….and what a generous gift he gave someone! D: not too much, actually–most of what you’ll find is purely anecdotal. I’d love to see a scientific, longitudinal study about this. my brother was a good person, but he was also a liitle bit ornery. — I think the recipient of his organs might think of them less as a gift, and more of a surprise package. Like those cans of macadamia nuts that come with a spring-loaded snake. Lisa, what a powerful post! Lisa, thank you for the Macadamia nut/snake comment to get me laughing because this post had me about in tears. What a lovely tribute to your brother, and to Jess and her awesome book. This post made my day. When my brother died my parents donated his eyes (he had kidney disease so no one wanted those) and I’ve always loved the idea that he was still looking out on the world. Oh, now I’m in tears again after reading Eileen’s comment!! I’m so sorry, I didn’t mean to make anyone cry! Really, I was laughing when I wrote this last night, thinking about a daredevil librarian who couldn’t figure out what had gotten into her. OHHH! I’m so sorry — no tears! You should be celebrating — you have a wonderful book. We’re so proud of you! Lovely post, Lisa! And great book Jess!! (And I now that I’ve read it, I DO believe in cellular memory). Lisa, your brother gave “life” to so many that I can’t imagine a more wondrous gift. No, neither you or Eileen brought tears to my eyes, instead there’s a feeling of joy at how much your family shared. DRIVING SIDEWAYS could prove more than entertaining, how wonderful if it also encouraged organ donation!